The generosity of our community continues to amaze us as cards and letters keep coming in since we first shared our journey with Grace. The crazy thing to Mary and I is that it’s not just from the Hillsboro community or Raymond area, where I grew up, but the support comes from all over, especially Montgomery County. Mary and I really work hard to make the newspaper something to be proud of – not just for Hillsboro, but for Montgomery County as a whole. That work has really helped us build relationships both in our hometowns and outside them, but I don’t think we realized how much people cared until the news about Grace broke. A testament to that point came last night at the Hillsboro boys basketball game at the Litchfield Invitational Tournament. As we were sitting in the stands at Simmons Gym, Litchfield Assistant Coach and SADD sponsor Jason Cooper stopped by with something for Grace. Jason gave us a bag from the LHS SADD group, filled with Panther goodies like rally towel, a basketball and pom poms, which Grace played with the entire second half. While we really appreciated the gesture, Jason had one thing wrong. Grace is totally a Panther fan. And a Redskin fan. And a Lancer fan. And a Topper fan. We are blessed to live in such a supportive community and we are always rooting for Montgomery County too do well. 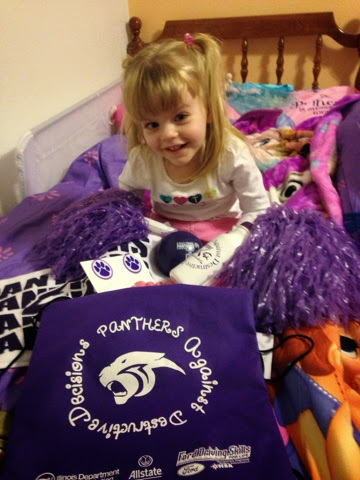 Grace LOVED her gift from the Panthers Against Destructive Decisions group, especially the pom poms. Again, so nicely put. Thanks for sharing. Once again Grace has a super smile on her face. It can light up a room. We all keep smiling for her as well. Go Grace.